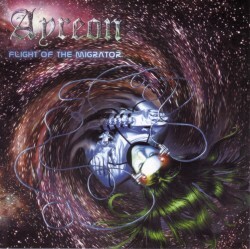 Universal Migrator Part II: Flight of the Migrator is Arjen’s fifth Ayreon release. At the time of the original release of the albums comprising the Universal Migrator (2000), Arjen had enough songs for a double CD. But at the time he was under the impression that his fan base was divided into two different camps — prog and metal — and that there was little genre crossover between the two. So he decided to release two separate CDs, one with the proggy tracks (The Dream Sequencer) and another with the heavier, “metal” tracks (Flight of the Migrator). His idea was that fans could then choose the CD that best fit their musical preferences. The two albums were released simultaneously, and Arjen’s surprise both CDs received favorable reactions, with most fans purchasing both! Later in 2004, when Arjen moved from Transmission to InsideOut Music, Flight of the Migrator was re-released together with the Dream Sequencer as a 2-CD special edition called The Universal Migrator: Parts I & II. As only 4 years had passed since the original release of the separate albums, Arjen did not add any bonus features because he felt that this would be unfair to the fans who had already purchased the albums. The Universal Migrator Part II picks up where Part I The Dream Sequencer leaves off, continuing the story of the last man alive on Mars as he decides to venture further back in time. He wants to go all the way back to the time just before the universe was created, a time when there was nothing but chaos. The Colonist witnesses the big bang and the creation of the first soul: The Universal Migrator. This soul divides itself into various new souls that each go in search of planets to inhabit. This is how they bring life to various planets and start different civilizations.